Greensboro, NC - The night air was cool but electric as the field for the Nike Outdoor Nationals boys’ two mile took the track. Even though the hour was late, even though the crowd was still buzzing from a scintillating boys’ 4x800 that saw 6 teams finish between 7:40 and 7:42, even though the girls’ two-mile race had moments earlier come down to a stretch drive between senior Ashley Higginson and junior Neely Spence, this was different. 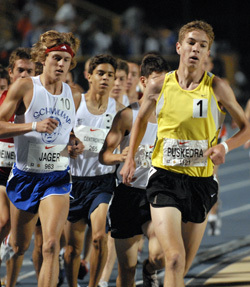 This was a clash of titans, the #1 boys’ miler in the country facing the #1 boys’ two-miler. 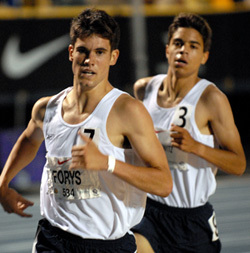 Of course it was far more than that—the field was stacked with an unprecedented wealth of talent—but in the end it became what everyone hoped for: Colts Neck NJ senior Craig Forys versus Broadneck MD senior Matt Centrowitz, head-to-head with a lap to go. Rarely does an event surrounded by this much anticipation deliver, but less than nine minutes after it had begun, the boys' two-mile had become the sort of race which leaves seasoned track experts and sober officials giddy on the infield, running back and forth to display their stop watches in disbelief. “The plan for today...” Brooks prompted. 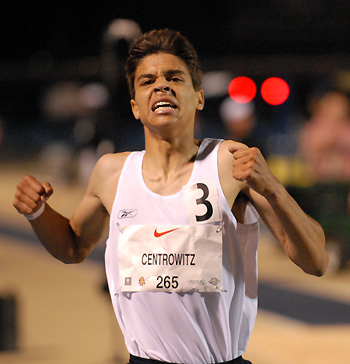 “...was to win,” Centrowitz said simply. Covering an ambitious move by Forys with two laps to go, the smooth-striding Centrowitz rode the shoulder of his rival until the final turn, where he shifted into a gear Forys couldn’t answer and ripped down the homestretch of a 58.2 closing quarter straight into the record books. No one did. His winning time of 8:41.55 equals the #3 US high school boys’ time ever, tying him with Steve Prefontaine, leading 10 others under 9-minutes, and turning the race into an instant classic. Forys crossed only strides behind, having paid for his early gambit but still coming home in 8:44.53. Elliot Heath slipped past Evan Jager for third, 8:46.12 to 8:47.59. Utah’s Luke Puskedra, as many expected, pushed the early pace, dragging the field through splits of 63, 2:10.6, 3:17.9 and 4:25.7. The key actors were never far from the front, with Centrowitz, Forys and Jager clearly marking one another to make sure no one sprung an unexpected move. After a 67.4 fifth lap brought the field past in 5:33, the real racing began. Jager surged past Puskedra, with Centrowitz and Forys both covering and the pack hanging close. 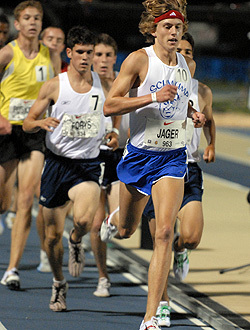 Jager delivered another 67 (6:40) before a restless Forys bolted on the curve and blew the race open. From there it became a battle for the ages, with Forys leading Centrowitz through a sizzling 63-second penultimate lap (7:43.1) and setting up the final drive. Down the backstretch they flew, with Centrowitz shadowing Forys into the final turn and then unleashing a devastating dealbreaker that drew an audible gasp from the crowd. A twenty second PR. A meet record. The #1 time in the country. Equal to the #3 time ever. The fastest American schoolboy since 1979. As for Higginson, her calling card as she’s become one of the nation’s best distance runners hasn’t really been a devastating closing kick, but that’s exactly what she delivered Friday night. In fact, it was pretty similar to what Centrowitz did to Forys minutes later, though Ashley surely would have liked those results reversed for her teammate. But for her progress, the Colts Neck sr, NSIC 2-mile, and NTN champ must surely be thankful for all of 800s and 1600s she got her coach to let her run all season.